Watch the video of this post at Bilingual Monkeys TV and subscribe to my YouTube channel. When it comes to raising bilingual children, the most common concern I hear—and this is a frustration felt by families in all parts of the world—involves strengthening the child’s ability in the minority language and getting the child to use that ability more actively. With this post, I hope to boil the problem down into 7 essential steps that will enable busy parents to conceptualize this issue clearly and take effective action in order to realize even greater success on their bilingual journey. When there are shortcomings in exposure and need, a stronger commitment is required for making mindful, proactive efforts on a daily basis. The bilingual aim—if it’s truly an important goal to you and your family—must be made a higher priority and placed more at the center of your lifestyle. Without this firm commitment to addressing the problem as persistently and resourcefully as you can, it will be hard to fortify the exposure and need that are necessary for promoting stronger language development and more active use. In fact, the majority language, as it continues its relentless progress, will likely grow even more dominant. Whenever possible, first take a hard look at the basic conditions of your situation and start here by reshaping these conditions so they provide more solid support for your aim. These “larger actions”—like the language use within your family, the child’s schooling, the frequency of travel to a minority language destination, or even your own work schedule or place of residence—can have a stronger and broader impact on the child’s bilingualism. While “smaller tactics” are certainly useful, too—techniques or tricks that can help promote language development and use—these ideas are most effective when combined with “larger actions” that can fortify the underlying circumstances of your bilingual journey. Be as proactive as possible about increasing the amount of exposure to the target language that the child is receiving on a daily basis. Playful, engaging exposure is the single most important factor in promoting stronger progress and active use. Along with establishing and sustaining effective habits and routines (talking a lot to the child, reading aloud each day, etc. ), commit to enriching your home with a steady stream of suitable resources in the target language (books, especially, and if children’s books in your target language are hard to come by or don’t suit your kids, get a stack of colorful “wordless picture books” and simply tell them the stories in your own words). The more resources you have, the more you can potentially engage the child in meaningful interaction and provide a greater amount of productive language exposure. And as you seek to put more emphasis on the minority language, you will likely further your cause by mindfully making efforts to “de-emphasize” the majority language and restrain its dominating influence. For minority language parents, the primary aim of the first few formative years is to “condition” the child to communicate in the minority language once he or she begins to speak. This is achieved by attending to the two “core conditions”: providing ample exposure to nurture language development, while cultivating the child’s need to use that language actively. This need, however, can be undermined in circumstances where the minority language parent also regularly uses the majority language with the child or in the child’s presence. While I encourage parents to minimize their use of the majority language to the extent possible—particularly during these early years—I recognize that, for many families, this can be quite challenging to carry out in practice. In order to strengthen the child’s need for the minority language, it may be necessary to seek out support beyond the immediate family to create “monolingual” experiences and input: extended family, other caregivers, schools and tutors, travel, etc. Narrate the time you spend together in order to bathe your child in the minority language on a continuous basis. Expand on your child’s utterances in the minority language to model richer, fuller language use. Recast utterances in the majority language to model appropriate usage in the minority language. Offer choices when asking a question—as opposed to an open-ended question—so the child can more easily respond in the target language. When children are reluctant to speak the target language, you could also try these four tricks to stir motivation. The success of these tactics will naturally depend on the particular parent and child, but they’ve worked well for some families. Just be sure to pursue them with a playful spirit. Establish the “rule” that all requests must be made in the minority language. If the “wrong” language is used, you don’t respond. This sort of strategy could help pave the way for more active use of the language in general. Respond to requests based on the language used. If the child makes a request in the majority language, you could respond, but very, very slowly, as if moving in slow-motion. If the child wants you to respond more quickly, the target language should be used. Introduce a new toy (a puppet, stuffed animal, or doll), animal companion (a dog, cat, rabbit, etc. ), or even a new baby and establish the idea that this toy, pet, or infant is “monolingual” and can only comprehend the target language. Make “mystery” an ongoing part of your efforts to promote engagement and language use. For example, create a “mystery box,” with items hidden inside on a regular basis, but establish that all guesses must be made in the minority language. Or announce a “mystery trip” and require that the target language be used to talk about it. Again, at the heart of language acquisition and active use lie the two “core conditions” of exposure and need. To get a bilingual child using the minority language more actively, it is these two areas that should be mindfully considered and proactively addressed. Meanwhile, despite the frustrations we may feel over this situation, we must continue to pursue our efforts as patiently and playfully as we can. 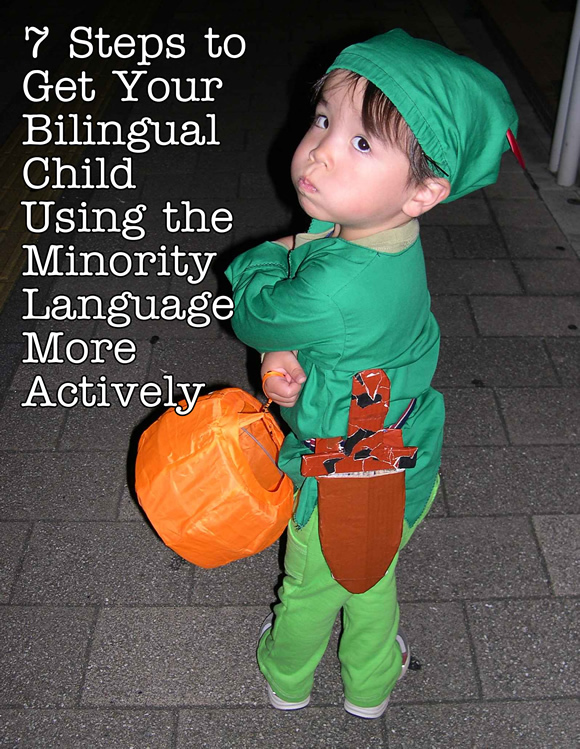 In this post I’ve offered an overview of how to approach the pivotal challenge of advancing and activating a child’s ability in the minority language. For much, much more—since practically every aspect of my work is tied, in some way, to the fundamental aim of effectively addressing exposure and need in order to realize greater bilingual success—I encourage you to continue gathering ideas and inspiration by exploring this blog, my forum, and my book. How about you? What are your thoughts or ideas regarding this important issue? Great work, you’ve definitely refined a big subject down to the essential. These 7 points are definitely important. Cameron, thank you for your kind feedback. Yes, it’s a big subject—in fact, my blog and forum and book are all about addressing it, in one way or another—but boiling it down like this, conceptually, can hopefully make the challenge more approachable, more manageable, and encourage further efforts that will promote greater progress and success. I was feeling a bit frustrated with my son’s reluctance to speak my home language (minority). He understands everything in both languages but mostly uses the majority language. My husband found your website and I must say it has some amazing advice I never thought of! Jojo, thank you for your comment. I’m really glad you feel more encouraged and I hope you and your family will continue to find my work a helpful source of support on your bilingual journey together. Please enjoy my book, and if you have any questions, feel free to reach out directly, via my forum The Bilingual Zoo or by email. I’ll be as helpful as I can! Happy reading! Hi, I work in the UK with toddlers in a minority language setting where most of parents only speak the majority language. They put their children in our setting as they want them to be bilingual even though they are not. What advice could I give these parents? Claire, I don’t know the details of the situation there, so I can only speak more generally, but success at fostering active bilingual ability, whatever the circumstances, always comes back to the two “core conditions” of exposure and need: the child must receive an ample amount of exposure to the target language and feel a genuine need to use it. So this is the main principle to keep in mind and I would encourage the parents you work with to lend their support to these two “core conditions” at home to the degree they can (making efforts to learn the language alongside their children, building up their books and other resources in this language, making further connections with other speakers of the language, etc.) so that the process of acquisition becomes even more productive. Leaving all this up to the school might be sufficient, I can’t say, but it’s undoubtedly true that their children will make greater progress if the parents themselves also stay actively involved. For much more, please have your community visit this blog and The Bilingual Zoo forum. Best bilingual wishes to you all! Do you think I could use the “ml request rule” and “slow-motion response to ML requests” from your playful tricks suggestions with my 2 year old? Or is it still too early? Amy, every child is different, of course, but I think these sorts of “tricks” will generally be more effective with children who are a bit older and have matured to the point where they’re able to make more conscious decisions about their behavior. I don’t think most very small children could be expected to mindfully control their behavior in these ways. Moreover, even if they wanted to, they likely won’t have enough active language ability yet to satisfactorily meet these expectations and the result could well be frustration on both sides. So my best advice is to continue pouring on the exposure during these early years and have those efforts promote her language use more indirectly.